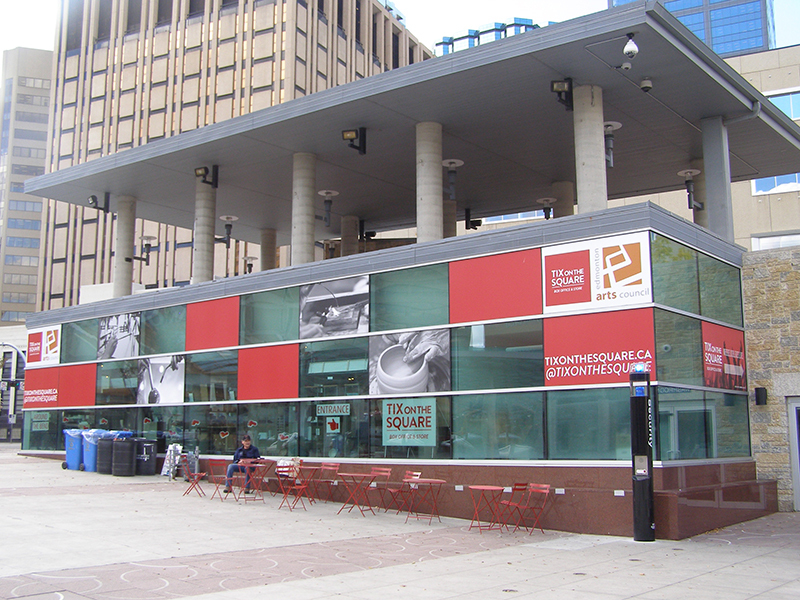 Churchill Square has a number of exciting facilities that help the space come alive with festivals and community activities. 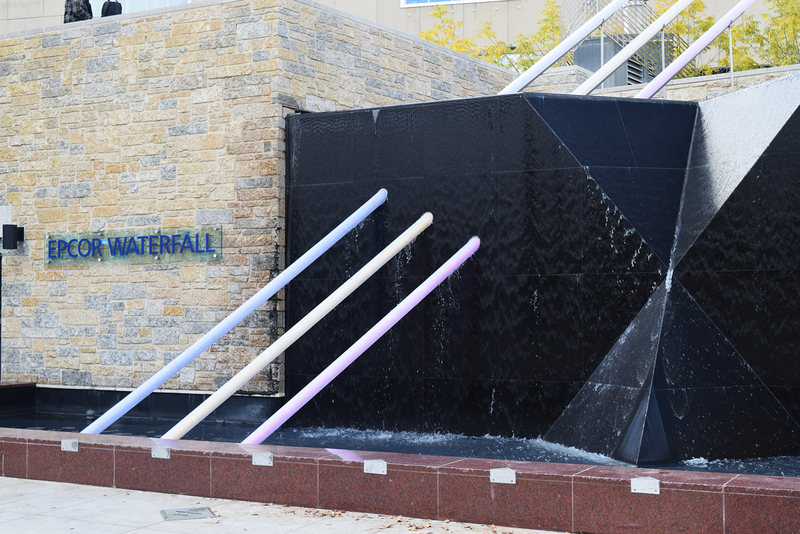 The Epcor Waterfall, titled "Light Venturi", was created by Terry Frost and operates from late May until early September. This piece contains three light tubes representing the Northern Lights. 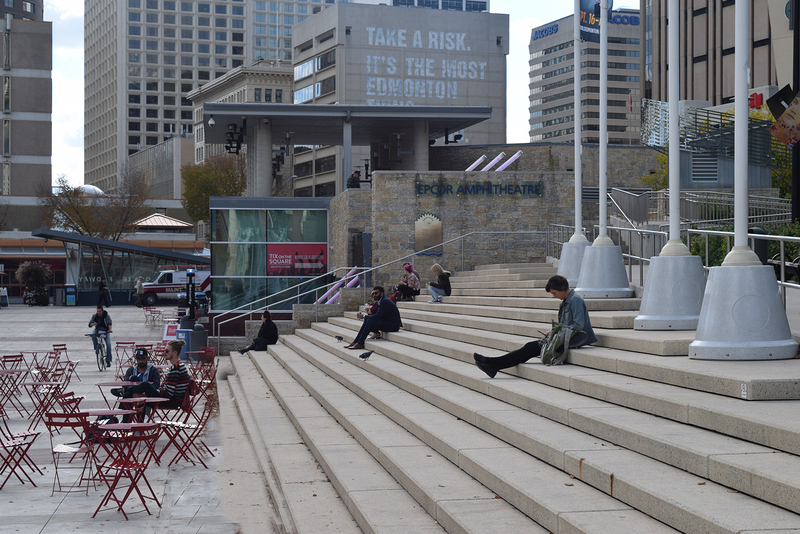 The EPCOR Amphitheatre is a place where visitors can sit and watch events and entertainment. The amphitheatre can seat up to 500 people while the Square has standing room suitable for up to 12,000 people. 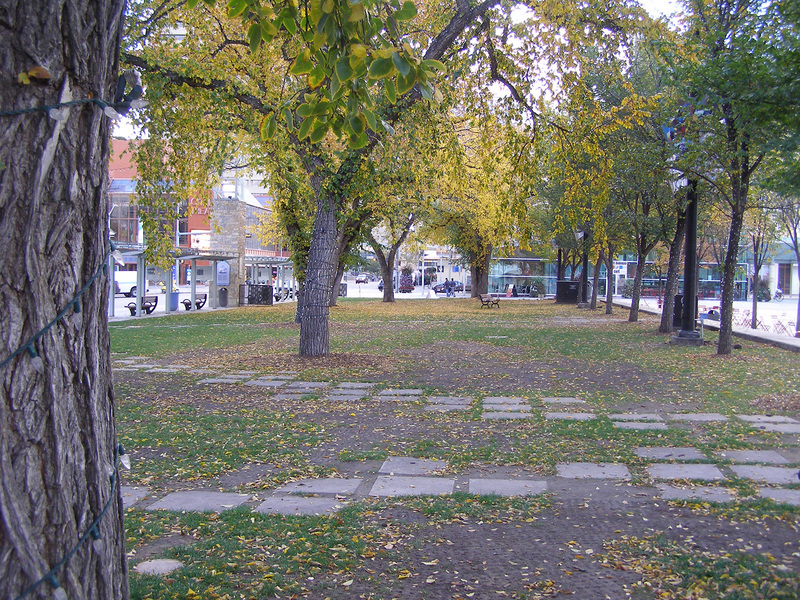 Churchill Square was redeveloped thanks to the generous donations of individuals, companies, not-for-profit groups, and all three levels of government. These donors are recognized in Churchill Square on the donor plaques and panels. The stainless steel donor panels are located on the west side of the Centennial Pavilion. 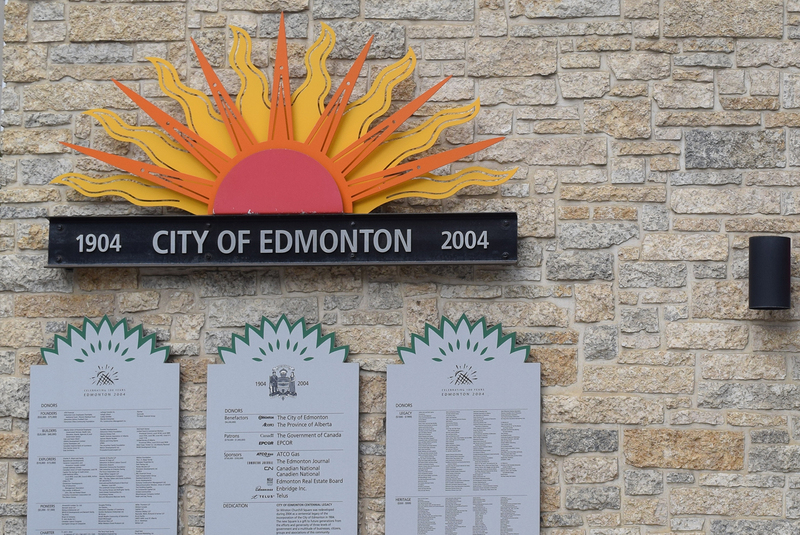 They tell the story of the Edmonton Centennial 2004 Legacy project and list the benefactors, patrons, donors, and sponsors of Churchill Square. Located throughout the Square are the donor plaques. These bronze plaques recognize contributions from Legacy, Heritage, and Community donors to Churchill Square. The plants in the West Garden represent Borealis plants that are typically found in Alberta. 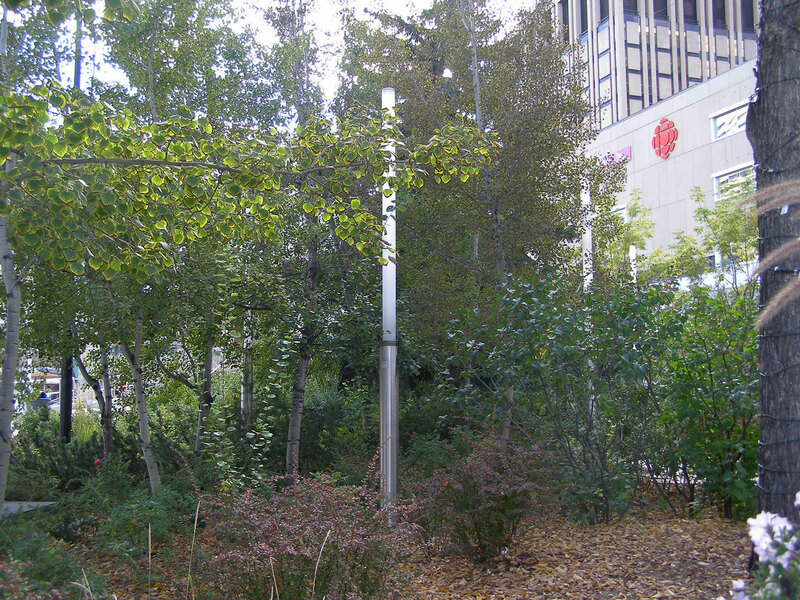 The gardens also feature several vertical light poles representing the northern lights. 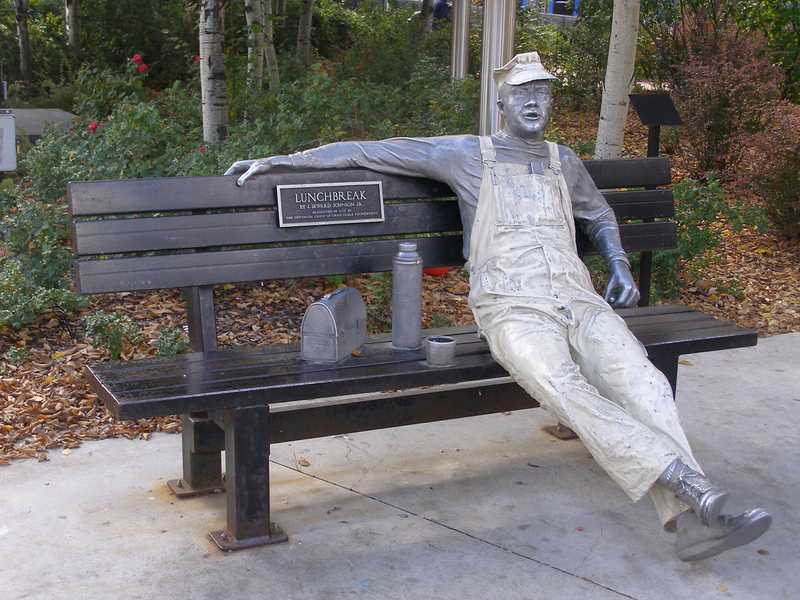 The Edmonton Journal's Narrative Garden Sculpture, titled "Catching Neutrinos", was created by Darci Mallon. It is a 10 foot high cone made from solid granite. The cone highlights historic headlines from the Edmonton Journal over the past 100 years. 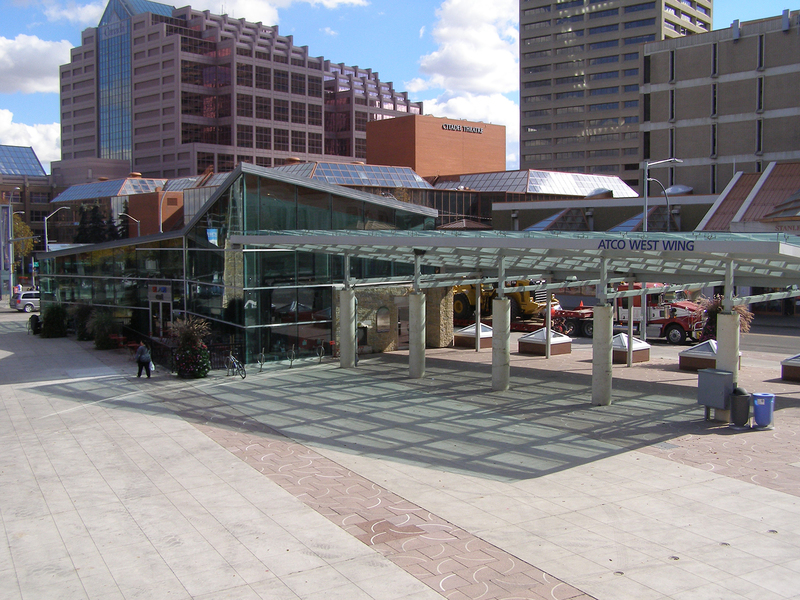 The Centennial Pavilion houses the Edmonton Shop on the Square, the Observation Deck, TIX on the Square, and pedway access to the LRT's Churchill Station. It mirrors the open and bright architecture of City Hall. 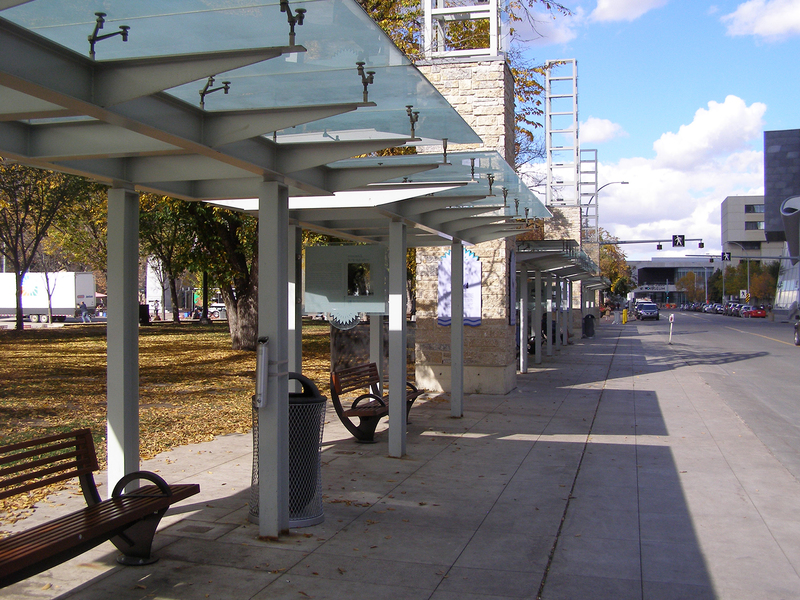 The Observation Deck is located on the second floor of the pavilion and can be accessed via the elevators, the north ramp, or the stairs off 100th street. Public washrooms are located here. The South Pavilion is located on the south side of the Square and is designed with a glass ceiling that peaks at 17 feet, complimenting the pyramid architecture of City Hall. It includes the ATCO West Wing, Enbridge East Patio and Three Bananas Cafe. The ATCO West Wing and Enbridge East Patio both feature outdoor gas fireplaces and seating. The gas fireplaces are significant as they represent the arrival of natural gas in Edmonton in 1923. The Three Bananas Cafe is a European style bistro enclosed in the pavilion. 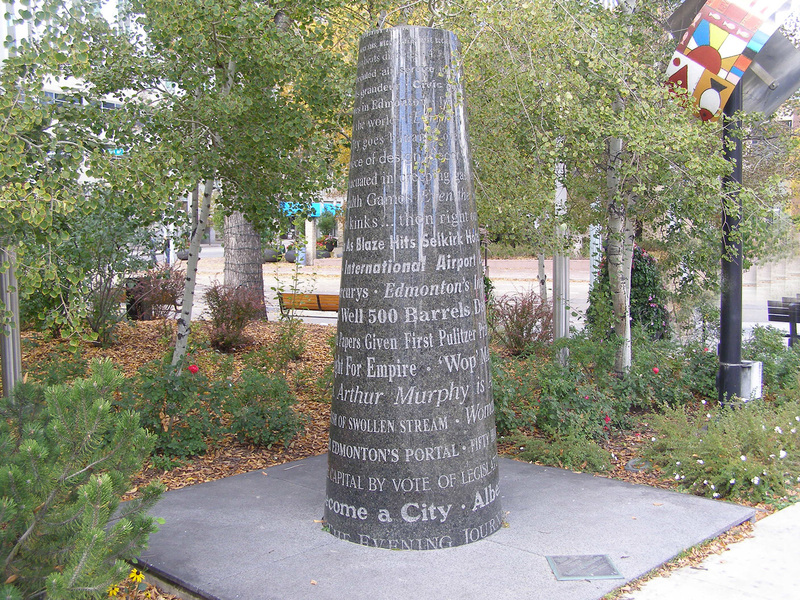 The 99th Street Union Promenade represents the contributions unions have made to the City of Edmonton. 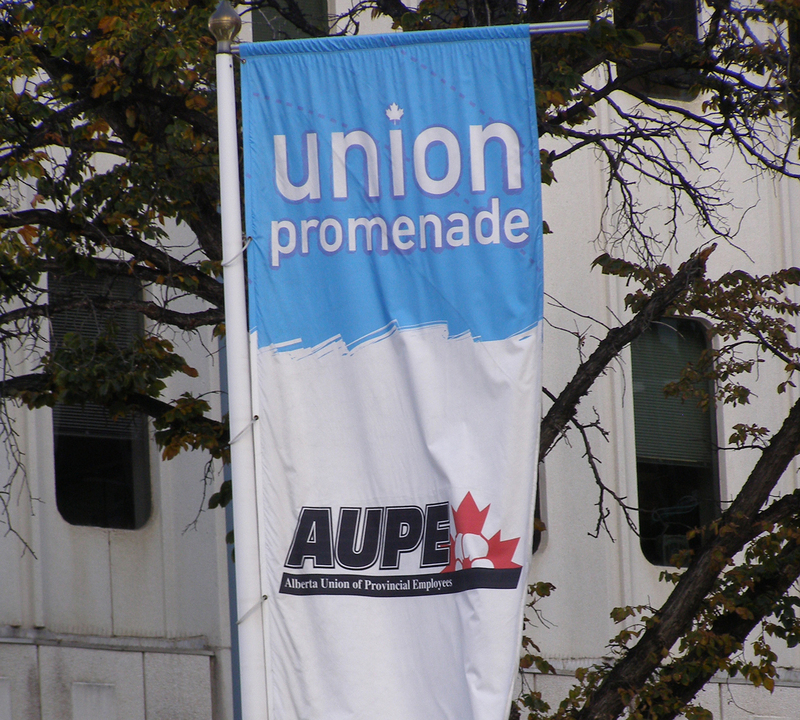 The street is lined with five fiberglass poles with coloured banners. Sponsored by the Edmonton Real Estate Board, Realtor's Row consists of 25 panels telling the story of Edmonton's economic development over the past 100 years. It also features nine-arbour glass canopies, and five Story Poles depicting themes of life common in our community: Arts, Community, First Nations, Industry, and Sports. The East Formal Gardens is the perfect place to sit and relax during the spring and summer months. The space features bronze plaques recognizing the garden and tree donors. A large tree located in the northeast end of the gardens is dedicated to Joe Shoctor, a prominent activist in the revitalization of downtown Edmonton and founder of the Citadel Theatre. Renewal of the East Garden will include a new, durable surface treatment to accommodate festivals, events and public activity as part of the Civic Precinct Surface and City Hall Fountain Renewal Project. 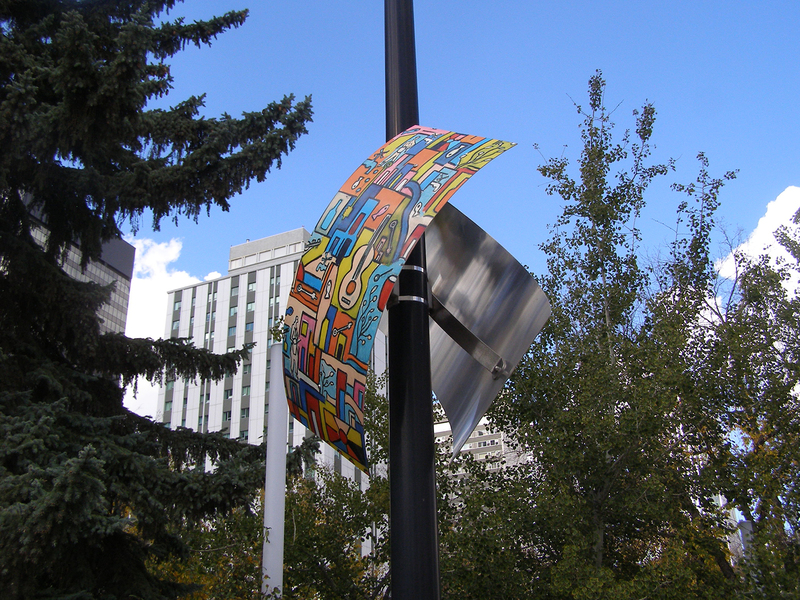 The metal banners project was initiated by The Places, Art & Design in Public Places Program and the Downtown Business Association, to collect images that represent Edmonton's diverse cultural make-up. Thirteen artists were selected for the project and 29 of their images were chosen. The project now displays these images year round on 24 sculptural metal banners located on the 8 light poles on Churchill Square. The bronze statue of Rt. Hon. 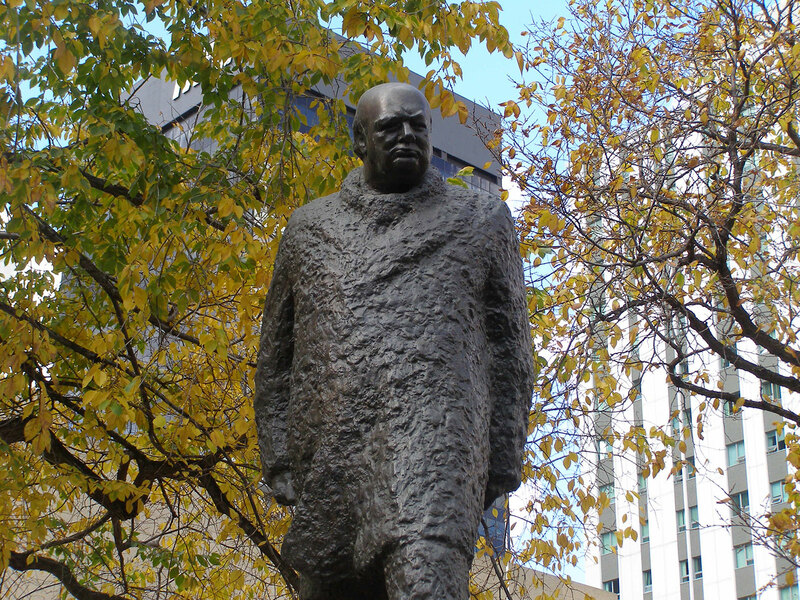 Sir Winston Churchill Spencer was sculpted by Oscar Neman and unveiled by Sir Winston Churchill's daughter, Lady Mary Soames, on May 24, 1989. 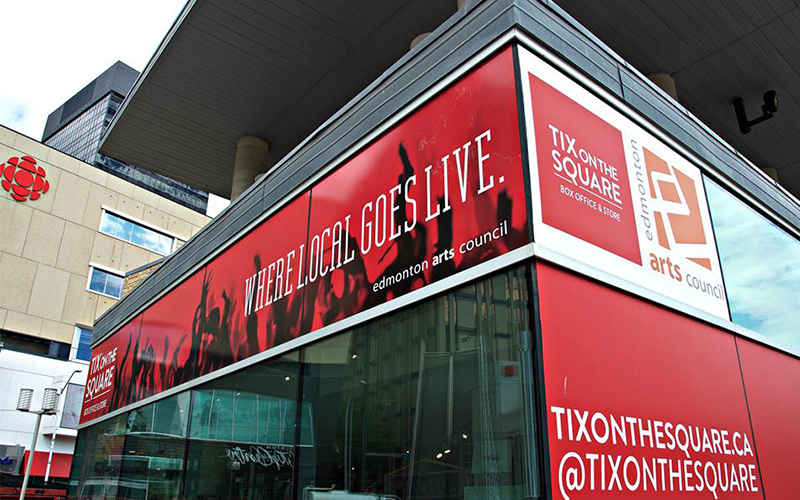 TIX on the Square is a not-for-profit box office and artisan boutique owned and operated by the Edmonton Arts Council. Located in the Centennial Pavillion, on southwest corner of Churchill Square, TIX is your destination for unique made-in-Edmonton gifts, including jewelry, pottery, photography, Edmonton themed apparel, books, music; and ticket sales for Edmonton events, concerts, plays and fundraisers. TIX is Edmonton's main source of information for the arts in our city, featuring the best in local artists, performers, writers, and musicians. Their central location means they are a great place for visitors to find out about upcoming events and purchase souvenirs. They are also a community hub for Edmontonians who want to support local artists and check out theatre and dance performances, concerts, festivals, fundraisers and more.